Laparoscopic and minimally invasive surgeries have continued to become more common and refined in recent years. Generally, the less invasive the surgery, the less risk is involved, which is of course a healthcare win. Medical devices are helping with this shift, and I've written about some minimally invasive surgical devices here, from assisting with weight loss to avoiding open heart surgery. A new device aims to make these surgeries even easier–and potentially more accurate–by increasing visibility at the internal surgical site. Recently approved via the de novo pathway, Alesi's Ultravision™ clears smoke in the abdominal cavity during various laparoscopic surgeries, including urological, gynecological, gastrointestinal, and colorectal procedures. FDA defines the device as a surgical smoke precipitator: "a prescription device intended for clearance of the visual field by precipitation of surgical smoke and other aerosolized particulate matter created during laparoscopic surgery. " Alesi explains it thusly: "[An] Ionwand™ [that] creates negatively charged gas ions in the abdominal cavity, which move towards the “positive” patient tissue. As the ions move, they collide with water vapour and particulate matter and draw them away from the surgical site. Particles land, and the electrical charge flows back to the generator." In short, this device doesn't draw out the smoke but rather forces it to dissipate within the cavity. This article explains that "Ultravision™ launched [overseas] in 2014 as the world’s first device for actively clearing the smoke that is generated by modern surgical cutting instruments during laparoscopic surgery, without the need for the slow and inefficient process of filtration. The device addresses a significant challenge for surgeons who, without Ultravision™, have been forced to operate with poor visibility and to pause surgical procedures at regular intervals to reestablish clear vision. Alesi has demonstrated clinically that the use of Ultravision™ can improve surgical efficiency and improve average procedure time by reducing the disruption caused by poor visibility. Ultravision™ goes further by solving the problem of smoke being released from patients into the operating theatre throughout a procedure – something that is increasingly causing health and safety concerns to healthcare workers worldwide. Ultravision™ is the only product on the market that can protect surgical teams from exposure to the smoke generated during surgery whilst at the same time reducing the levels of cold, dry carbon dioxide gas to which patients are exposed. Greater exposure to carbon dioxide is a feature of all other smoke-handling products, and it carries with it risks including increased patient cooling and more chance of post-surgical adhesions, pain and infection." Alesi indeed states that the benefits include improved visibility, fewer pauses in procedures, improved efficiency, lack of smoke being released, and less camera cleaning. 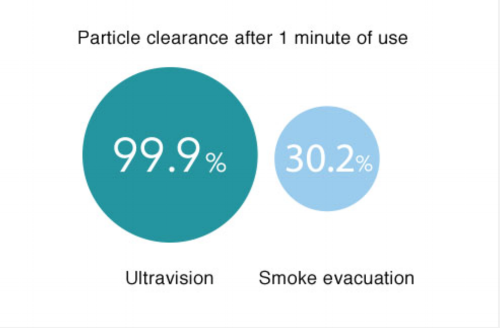 Ultravision™ is also more effective than simply evacuating smoke, boasting near-perfect particulate elimination within 30 seconds of being switched on. It does all of this without effecting the pneumoperitoneum (gas that is added to the abdominal cavity to enable this type of surgery). It's interesting to see how, as technology evolves, the tools to make it better, safer, and more efficient evolve as well. It reminds me of how medical technology is really a symphony. I look forward to seeing devices that are adjacent to procedures continue to evolve as we all strive for more innovative, safe, effective medical technology for patients and physicians alike.